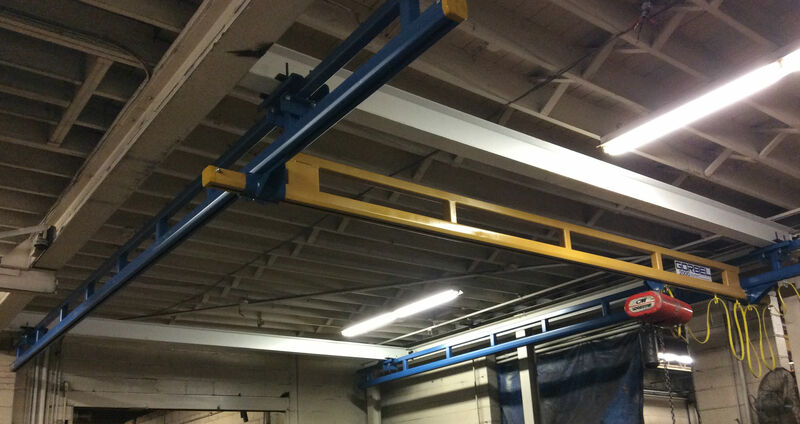 For those customers looking for overhead crane coverage in a small area of their facility, work station cranes are the perfect fit. With capacities up to 2 ton they are an excellent means of increasing assembly capabilities. Their enclosed track construction provides easy movement for improved work place ergonomics. Most free standing systems can be easily installed on a 6" concrete floor giving them countless possibilities as to where they can be utilized throughout your facility. If you want to maximize the capacity of one of these systems and take it up to 2 ton there are tractor drive options available to motorize trolley and end truck motion. If floor space comes at a premium in your shop there are also ceiling suspended versions available with all the same specifications. For more information on work station cranes, both free standing and ceiling suspended, please Contact Us.